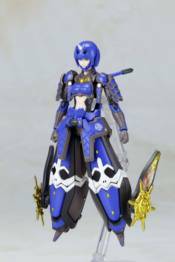 Kotobukiya presents a new plastic model kit based on the popular Phantasy Star Online 2 with the Indigo Guardian Shiki! Indigo Guardian Shiki stands 15 cm (6 inches) tall in 1/12 scale and includes multiple points of articluation to allow for the creation of custom poses! Indigo Guardian Shiki's bold indigo blue, black, and gold color scheme accentuates this Casts's armor. Build and display alone or alongside other Phantasy Star Online Plastic Model Kits from Kotobukiya!